Welcome back to yet another edition of This Week In Running, brought to you in part by iRunFar.com, your source for mud, mountains, miles and so much more. Today’s installment of TWIR will look at results from last weekend’s Headlands Hundred and take a sneak peek at a few of the races on tap for the weekend of August 16 and 17, 2008. How about a quick look back at the results from last week’s 100-mile race, the Headlands Hundred Endurance Run, before we rush into this weekend’s events. Matt Aro was 2 minutes behind Evan Kimber at the 50 mile mark, overtook Kimber and opened up a 30+ minute lead at the 75.3 mile mark, en route to the victory in 20:23:52. Adelaido Solis finished second (21:15:00) and Kimber came in third (21:55:52). On the women’s side, Lauren Wincze did not trail at any checkpoint, winning in 27:29:48. Barbara Ashe came in second (27:47:48) and Nancy Warren third (28:27:34). Enough of the past. Let’s take a look at the week ahead as we move on with the show…..
Another week, another 100 mile race, and this weekend features a beauty, as we take a look at “The Race Across the Sky” – the Leadville Trail 100. 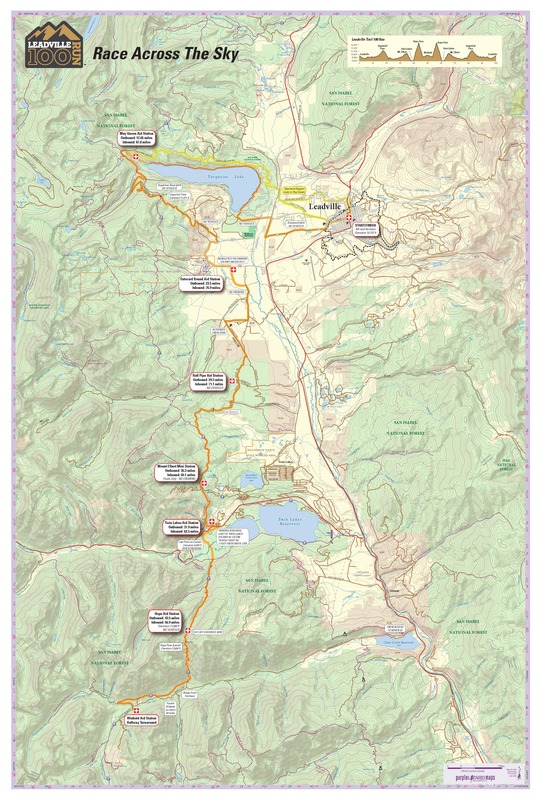 In short, the course is a 50 mile out-and-back through the heart of Colorado’s Rocky Mountains. The majority of the race course is on forest trails, although portions of it traverse mountain roads. The lowest point of elevation is 9,200 feet, with the highest at 12,620 feet at Hope Pass. A more detailed course description can be found right HERE. LT100 was first run in 1983. Race co-founder Kenneth Chlouber, an avid marathon runner, conceived of the race as a way to make Leadville famous and bring visitors during a period of economic downturn. When he told the local hospital administrator about his idea he was told, “You’re crazy! You’ll kill someone!” Ken responded, “Well, then we will be famous, won’t we?” The course is very difficult, with runners climbing and descending some 15,600 feet, with elevations ranging between 9,200-12,620 feet. Because of its difficulty, it is common for less than half the starters to complete the race ahead of its 30 hour time limit. In fact, never in the race’s history has more then 54% of the starters finished within the 30 hour time allotment. In 2006, of the 383 starters only 47 received the coveted handcrafted gold and silver trophy belt buckle awarded to those who complete the distance within 25 hours. Those who finish in under 30 hours receive a handcrafted silver belt buckle. Bill Finkbeiner, of Auburn, California became the first person ever to receive the “Leadville 2000-Mile Buckle” in 2003 for his twenty LT100 finishes. Finkbeiner, Tim Twietmeyer at the Western States 100 Mile Endurance Run, and Rick Gates at the Wasatch Front 100 Mile are the only 20-time finishers of 100-milers in the modern era. LT100 is one of the four 100-milers in the United States that make up the “Western Slam” (along with Western States, Wasatch Front, and Angeles Crest 100 Mile Endurance Run). LT100 is also a part of the Grand Slam of Ultrarunning (along with the Vermont 100, Western States, and Wasatch Front), and an optional part of the Rocky Mountain Slam (Hardrock plus three of four other races in the Rocky Mountains: LT100, Bear 100, Bighorn 100, or Wasatch Front). LT100 attracts some of the top ultra runners every year. Matt Carpenter holds the course record of 15:42:59 (set in 2005). Ann Trason holds the women’s course record of 18:06:24 (which has held since 1994). In the 2007 edition of LT100, Anton Krupicka crushed the field to win his second straight title. Krupicka finished in 16:14:35, over 3 hours ahead of second place finisher Harry Harcrow. The women’s race in 2007 was spectacular, with Tammy Stone winning in 22:44:54, a mere 4 minutes and 20 seconds ahead of Michelle Jensen (22:49:14). Neither Krupicka nor Stone are on the entrant list for this year’s event. [8/15 Update] For anyone who’ll be out at the race, Trail Goat (Bryon Powell) will be pacing Tim Long (#648) at a bit under 24 hours pace. If you see him, be sure to say hi! There are some other ultra events this week, including…..
Where’s Waldo 100k (Sat., Aug. 16 at Willamette Pass Ski Area, Oregon) – The 2008 & 2009 USA 100km Trail Championships, this event is a challenging loop-type course starting at the Willamette Pass Ski Area (70 miles east of Eugene, Oregon) at an elevation of 5,120 feet, climbing up several mountains including Fuji, The Twins, and Maiden Peak, before returning to the ski area. The route is 97% single-track trails. The race web-site warns that “it is not a beginner-level ultra and participation in the race should not be taken lightly.” Many top ultra runners and ultra running legends are expected to participate, including, Eric Clifton, Roy Pirrung, Mark Lantz, Meghan Arbogast, Beverley Anderson-Abbs, Hal Koerner, Sean Andrish, Nate McDowell, and former Waldo champions Krissy Moehl, Jeff Browning, Ian Torrence, and Rod Bien. El Vaquero Loco 50k (Sat., Aug. 16 in Afton, WY) – Difficult out-and-back course on single and double track trails that includes high-mountain lakes, steep, long climbs, and amazing views of the Salt River and Wyoming mountain ranges. The nearly 9,000 feet of climb/descent is fitting for a race directed by stud mountain ultra runner, Ty Draney. rday, with the Marathon portion taking place on Sunday. “The Pikes Peak Ascent® and Pikes Peak Marathon® will redefine what you call running. Sure, they start out like a lot of races on Any Street, USA. But your first left turn will have you turning in the direction of up! During the next 10 miles, as you gain almost 6,000 vertical feet, your legs, lungs, heart and mind will be worn to a ragged nothingness. But it won’t be until your last three miles, with still over 2,000′ of vertical to go, that you will realize where the Marathon got its moniker—America’s Ultimate Challenge. Weather is always an issue at Pikes Peak. It is simply, unpredictable, and runners can experience unusual and rapid weather changes above treeline. The temperatures can vary by as much as 50° F between the base of the mountain and the upper parts of the mountain. In the 2004 running, there was 6-8 inches of new snow on the peak on the morning of the Ascent. In the 2005 running, hundreds of runners were stranded on the summit when a huge storm hit the mountain. The possibility of chilling rain, snow and sleet showers, high winds and dramatic temperature changes are high. Both the Pikes Peak Ascent and Marathon are extremely popular events. The Ascent field is limited to 1,800 runners, the Marathon to 800. “Field 1” of the Marathon event filled to capacity in less then 26 minutes, and “Field 2” filled its capacity in less then 50 minutes for the 2008 running. [Update 8/14] This just in from the Fastest Known Time Department… As Grae Van Hooser pointed out in the comments, Peter Lubber is going for a speed record on the 165 mile Tahoe Rim Trail this weekend. He’ll try to best the mark of 45:58 set by Tim Twietmeyer in 2007. Well, that’s it for this week’s edition of This Week In Running. Make sure to join us again next week! Weasel,Best of luck at the Pikes Peak Marathon. I'll be a couple miles northeast while I'm pacing at the Leadville 100. Last I read was that 1-8 inches was possible on the summits on the Sawatch and Mosquito ranges (i.e., Leadville mtns) by Saturday night. That's at least double all the snow I saw last winter! Grae,If you read this, please contact me off line. Thanks for the heads up re Lubber's run.